A court in the Netherlands has ruled the Dutch state was responsible for the deaths of three Bosnian Muslims in the 1995 Srebrenica massacre. The Dutch were in charge of the UN "safe area" when Bosnian Serb forces overran it in 1995 and killed 8,000 Bosnian Muslim men and boys. The court in The Hague ruled that the Dutch troops should not have handed the three men over to Bosnian Serb forces. The case centred on three Bosniaks (Bosnian Muslims) who were working for the Dutch force, Dutchbat, during the 1992-1995 Bosnian war and were among thousands who took shelter in the UN compound as Bosnian Serb forces commanded by Gen Ratko Mladic overran Srebrenica on 11 July 1995. Two days later, Dutch peacekeepers forced the Bosniaks out of the compound. The verdict is historic. It is believed to be the first time a state has been held responsible for the actions of its troops working under UN auspices. This could have far-reaching implications for other countries that may be wary of sending their troops on UN peacekeeping missions. The Dutch government, which the court ruled had "effective control" over their troops, has been ordered to pay compensation to the plaintiffs. This could pave the way for compensation claims by other Srebrenica victims, especially those whose relatives were similarly forced off the Dutch compound, a designated UN safe haven, where they had sought protection. The verdict, which government lawyers say they have to study before deciding whether or not to appeal, will no doubt reopen a painful chapter in Dutch history. In 2002, the Dutch government collapsed after an investigation by the National War Documentation Institute blamed them and the UN for sending ill-equipped Dutch soldiers on an impossible mission. "The court ruled that the Dutch state is responsible for the death of these men because Dutchbat should not have handed them over," a spokeswoman for the court said. The appeals court's judges have ordered the government to pay compensation to the dead men's relatives in a ruling that could have implications for similar cases against the Dutch state, says the BBC's Lauren Comiteau at the court. The verdict came as a surprise to both the Bosnian Muslim plaintiffs and government lawyers, our correspondent says. The court said that even though Dutchbat was working under the UN after the fall of Srebrenica, in a situation which they called "extraordinary", the Dutch government became more involved with Dutchbat and the evacuation, and in that sense they were responsible. A court had previously ruled in 2008 that the Dutch state was not responsible for the deaths of Bosnian Dutchbat employees and their families because the soldiers were operating under a UN mandate. 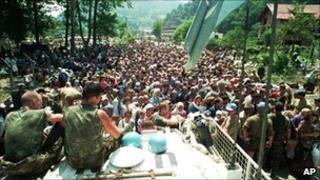 When Bosnian Serb forces overran the Srebrenica enclave, Bosniak Muslims converged on the Dutch base. Between 4,000 and 5,000 were allowed into the compound, an estimated 15,000-20,000 remained outside. Media captionHasan Nuhanovic, whose father and brother were killed in the Srebrenica massacre: "This is a positive turn"
Two days later, Dutch peacekeepers began expelling the refugees from their base, as the Bosnian Serb troops had demanded. A lawyer for one of the plaintiffs, Liesbeth Zegveld, told the BBC that relatives of other Bosniak men who had been handed over by Dutch troops "may stand a good chance to win their case in Dutch courts". About 300 men of military age are estimated to have been expelled from the compound. The case was brought by relatives of Rizo Mustafic, who worked as an electrician for Dutchbat, and by Dutchbat interpreter Hasan Nuhanovic, who lost his father and brother in the fall of the Bosniak enclave. They filed a lawsuit against the Dutch state because Dutchbat handed over their relatives to the Bosnian Serbs, and have been trying to get the Dutch government to take responsibility for their deaths for nine years. The ruling said even though the Dutch soldiers were operating under a UN mandate, they were under "effective control" of top military and government officials in The Hague when they ordered the hundreds of Bosniak men and boys out of their compound. The ruling said the three men were among the last to be expelled on 13 July, and by that time the peacekeepers already had seen Bosnian Serb troops abusing Bosniak men and boys and should have known they faced the real threat of being killed. "The Dutchbat had been witness to multiple incidents in which the Bosnian Serbs mistreated or killed male refugees outside the compound. The Dutch therefore knew that... the men were at great risk if they were to leave the compound," the court said in its ruling. Mr Mustafic was forced to leave and was separated from his wife just outside the compound fence and taken away, and was never heard of again. Hasan Nuhanovic was allowed to stay, but his relatives were forced to leave. The remains of his father and brother were recovered in 2007 and 2010. The Srebrenica massacre remains a sensitive issue in the Netherlands. In 2002, the government fell after an official report was heavily critical of Dutch actions when the killings took place. The conduct of the country's peacekeepers was highlighted again following the recent arrest of Gen Mladic. In May, during a televised debate featuring former Dutchbat commander Col Thom Karremans, Dutch TV aired footage of Lt Col Karremans drinking a toast to peace with Gen Mladic on the eve of the massacre, in what commentators described as a humiliation. The Dutch state, which has faced several cases in recent years over Srebrenica, has always argued that it was let down by the UN, which failed to give its troops sufficient support. Gen Mladic is currently on trial in The Hague, charged on 11 counts including genocide of Bosniaks and Bosnian Croats during the Bosnian war.